I’m clutching at straws here but I hope you can help me. My father was the Methodist minister in Sligo from 1948-1953. I was 11 years old when we left there, so the following must have occurred between these dates. I have vague memories of a ship full of refugees from Latvia, Lithuania or Estonia in the harbour. Everyone, at least in my memory, put on their emersion heaters full time as families from the over crowded ship took it in turns to bathe and receive a decent meal in our homes. I think the ship was going to Canada. What I would like to know is who were they, where they came from, why they came to Sligo, how long they stayed and did they arrive safely at their destination?!!!!! I seem to remember very moving scenes, people crying, the ship leaning dangerously as all the passengers crowded to one side to wave. My years in Sligo were very happy and formative, the Model school, the Feis Ceoil, the farm people, Strandhill, aaah heaven. My father took me to WB Yeats 2nd funeral. As you can see from my e-address I am an ex pat living in Holland for the last 35 years. I sculpt. I would be very grateful if you could point me in the right direction, it might even be an historical item you hadn’t stumbled upon! Thank you for at least reading my mail. Carol Cairns www.cairnsart.nl Gouda The Netherlands"
Ship of hope, ship of tears. It turns out that the ship was the S.S. Walnut sailing from Sweden toward Canada's Halifax harbor with her human cargo to make a bid for freedom in a new land. The 700-ton ship was originally built as a Royal Navy minesweeper and had living quarters for a crew of 18. 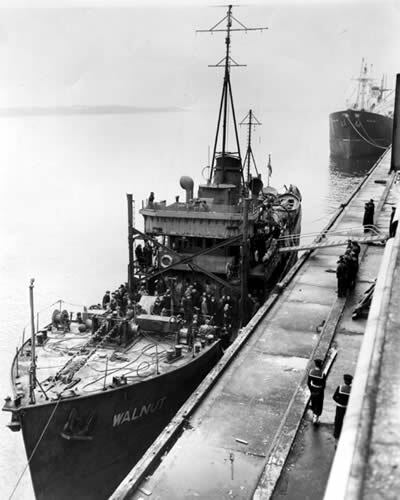 The Walnut was purchased and co-operatively owned by refugees, mostly of Estonian descent. Fully aware of the rough winter seas she would face in her journey, the little Walnut left Gothenburg (Göteborg), Sweden on the 13th of November, 1948. That the Walnut was even able to begin her journey was questionable. Could the 347 individuals wanting to reach Canada even fit on such a small ship? Would they reach their destination safely? Why did they risk their lives for freedom? Joe, what a delightful and informative site and lovely to see our story there! Maybe some old school friends from the Model School on the Mall (?) will see my name and get in touch. The teachers were Mr. and Mrs. Guy and Miss Allen whom we called Biddy!) I've just looked more closely at the photos in the link on your site. In the photo entitled 'three local priests blessing the passengers' it is my father who is blessing them....left-handed!! I probably wasn't far away from him but I cannot see myself. He is also in another photo further up. By the way did you know that the Queen of Tonga visited Sligo? She had attended the coronation of Queen Elizabeth. My father addressed her partly in Irish that he didn't know how to speak, nor did she understand!!! He had a great sense of fun. Tonga was a Methodist island so that's how my father got to speak with her. Dad was 6' + but she was taller! -speaking western Ireland Gaelic which I unfortunately lost when we moved to Dublin. Thank you for pointing out your website link with the Walnut ship. I shall get in touch with Carol Cairns, the Methodist minister's daughter. I see, like myself, she attended the Model School, though some years earlier. 'Tile Films' in Dublin have had a very positive response from a Canadian production company keen to work on a TV co-production. In the current economic climate, most of the funding would have to come from Canada. Many of the surviving Estonian passengers formed a tight-knit community in Toronto, building churches, forming choirs, and establishing their own Estonian school. They often greet each other with 'Hey Walnut!'" I have also been in touch with Mr John Mullaney who remembers the event well and has agreed to write his own recollections. Your website is a great fund of information on Sligo. Having left many years ago I only have a couple of contacts there now, but enjoyed a memorable weekend when I returned for the Leonard Cohen concert at Lissadell - magical!